One of the cool things about kids is that they see magic in everything. Because it's all new, it's all exciting, so even the most mundane observation can be a revelation. 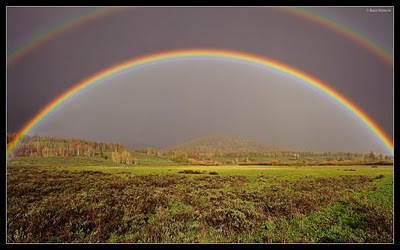 A rainbow isn't just a rainbow; it's a mystery with potential for leprechauns and riches. However, after seeing the same thing a few times, it becomes normal; everyday things are revealed as everyday things. A rainbow is just reflected light gone wrong (unless it's double, in which case, whoooaaa oh my god). This is why old people no longer get joy out of the world. Except that's not true. Rapid progress in technology puts a wrinkle in the ability to experience magic in modern mundane life. Consider this: a kid born in the 90s has never known a world without the internet. The ability to draw on something close to the entirely of human knowledge using a pocket-sized device, to anyone under 20, that's just the way you figure something out. Whereas at 30, I remember when figuring out a single unknown fact involved a trip to the library, looking through a card catalogue, carrying a stack of books to a table, and skimming through them until you stumble across what you're looking for. So to me? Being able to reach in my pocket, type half a misspelled search term vaguely related to what I'm looking for, then instantly get an answer? That's magic. All the way. Old people, born before the turn in the curve of the exponential rise in technological complexity, have experienced both sides of it. We can always see the way things are in the context of how things used to be, and re-experience the magic in them. We can gawk at a new iPhone the same way a baby gawks at a toy she has never ever seen before. Of course, I think a key to happiness is to find this joy in everything, regardless of whether it's because you're young enough to be seeing it for the first time, because you're old enough to remember its predecesor, or because you appreciate the awesomeness of life's riches both natural and man-made. Wait... are you one of the old people‽ I believe the politically correct term is "worldly." I guess I'm one of the old people, because despite having access to computers since I was 6 years old and getting my own when I was 10 or 11, I still find them fascinating when I think about all of the logic and engineering behind processors, hard drives, motherboards, etc. You're right - I was soo excited to get my iPhone. But I would guess this is the case for all generations. Wouldn't my grandfather have marveled at television and then colour television. I remember him thinking that the Whisper 2000 was the coolest thing in the world as he tried to listen to the neighbours talk through a brick wall. Not to mention his fascination with email. I guess no matter our age - we continue to find things that amaze us. It must be a very different experience for students these days. I think that's when you find out you're old, when you look at younger people and find that their experiences and expectations are just different enough from your own. I remember 'research' amounted to everyone piling into the library and copying by hand the relevant paragraph or two you could find in the World Book Encyclopedia. If you were lucky, you could find one or two helpful books dedicated to the subject. The internet was just starting to become useful in my last couple years of highscool. It took some work, but I managed to convince my English and History teachers that the Internet was a worthy reference source. I had to invent a means of citing an online source since the essay writer's style guide, written by a prof at Western, was still years behind. Anyone who misses those days of obscure information obtained inefficiently is nuts; things are much better now. I have to object, as I often do, to the term 'magic' when applied to technology. By similar means, each meal I eat is magic since I don't need to tirelessly work the land to feed myself. Clothing is practically disposable, a magical transformation in very recent history. Technology is a more complicated food and textile production but it's not beyond human comprehension. That doesn't mean that it doesn't fill me with awe and wonder, I just have no interest in becoming or bowing to magicians. I don't know that experiencing "magic" for old people is a new phenomenon. It was probably a marvel to view a television for old people in the 50s or the horseless carriage for old timers in the late 19th century. As you say, the crazy part will be the stuff that blows our minds. I was introduced to Google in first year university and haven't opened a book since, imagine the crap my grandkids are going to be blowing my mind with. Brian: I'm so old. Er, worldly. Although plenty of even older people have seen less of the world, I'm sure. Derek: What? I run Internet Explorer and get on the internets. WTF is a world wide web? FindingFlawless & Johnson: I think the big difference is in the pace of change now. In previous generations, a lifetime could go by between major advancement (eg, radio broadcasting was invented in the early 1900s, and stayed pretty much the same for 100 years). That gave people time to get used to it, without seeing it change. Now - especially for people who were around before things started changing so fast - the gap between old and new is getting wider and wider. Noah: I wouldn't encourage bowing down to incomprehension either. I suppose I only mean magic in its ability to do things that were not thought possible. I, too, would rather be the stage magician in on the secret, or a member of Clarke's sufficiently advanced civilization.